Do-It-Yourself Fence Installation for Property Owners – If you own a home or farm property, don’t settle for the limited selection of fencing products available in your area. Especially in smaller communities and rural areas, you may not have access to a full line of fencing products. 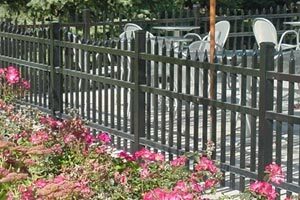 At our discount fence supply store, we offer the fences you need, in a wide range of designs and materials. Do-It-Yourself fence builders will find complete DIY installation instructions in every shipment. We’ll help you order everything you need for your fencing project, then arrange to have your materials shipped to you direct from the factory or distribution center. Request a free price quote for your fence project. Ask about our low-cost shipping offers, too. Fence Installation Contractors – You offer quality workmanship and service to your clients. Why not offer them a complete line of high-quality fencing and security gate products from our low-cost fence store as well? Don’t limit your client’s choices to just what’s available in your local area. Our fencing and security gate experts will help you build a complete order for your project. All materials will be shipped directly to your work site or your business location, ready for fast installation. Contact us now for a free price quote for your next project. Business Owners & Managers – Get the exact fencing, security gate, and access control products you need from the leading fence supplier in the United States. Wherever you are, you have instant access to the very best products right here on the International Security Products website. We’ll be happy to help you create a complete product list for your project, and then arrange shipping to your site. Our products are chosen for quality, durability, and ease of installation. Our volume ordering from our suppliers means maximum savings for you. Call us now to discuss your needs or to request a price quote. Industrial Property Managers – Security is a prime consideration for every industrial, commercial, and government agency site. Our supply store has a complete line of security fencing, entry systems, and access control products that can meet every industrial security need. Protect your property with high-quality products, shipped directly to your location from the nation’s top manufacturers. Compare our pricing with any other supplier, and we know you’ll choose International Security Products. Call us soon with your upcoming project or request a price quote for an immediate project. 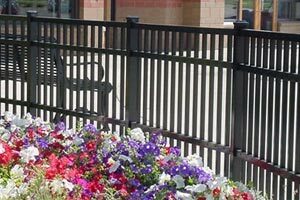 Government Agencies – Whatever your fencing, security, and access control needs are, our fence supply company has the expertise and top-quality products you need to complete your projects economically and on time. 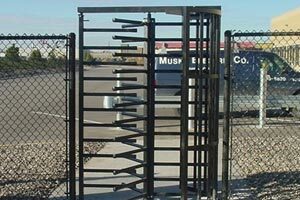 From turnstile access control systems for buildings or schools to complete fencing and security systems for everything from playgrounds to correctional facilities, you’ll find the products you need at International Security Products, along with the expert assistance to help you make the best choices. Contact us now to discover how we can work with you to streamline any security or fencing project. Our fence supply company understands that every fencing, turnstile, or security gate installation project is unique. Our consultants have the training, experience, and knowledge to help you make the right choices when selecting products. We’ve selected products and suppliers based on our knowledge of the industry and with a constant eye on quality, on-time delivery, and ease of installation. Our personal, hands-on ordering system is designed to help you create a complete product list so your order is complete, accurate and includes all components needed. We confirm every order with you before shipment to avoid costly delays. Our pricing is competitive with any supplier in the nation. Our fence prices are among the lowest, saving our customers 30-40% of the costs from other fence companies. Contact International Security Products today to discuss your fencing, security, or access control project or to request a price quote.